By now, the story is well-known. Lt. Col. Gene Hambleton, a 52-year-old USAF navigator, assigns himself at the last minute to fly on a bombing run below the DMZ in April 1972. He’s shot down behind enemy lines. And Gene Hambleton might just be an intelligence gold mine for the NVA—and for the Russians and Chinese. A former missile squadron commander for the Strategic Air Command, Hambleton knows stuff, lots of it. And so, a rescue operation begins. And not just any rescue op. It will become what author Stephan Talty calls the greatest SEAL rescue in history—and one of the deadliest. This mission was the subject of the book Bat-21 and the Hollywood movie of the same name starring Gene Hackman and Danny Glover. That fictionalized drama captured some of the essential information. But now we get the full story. 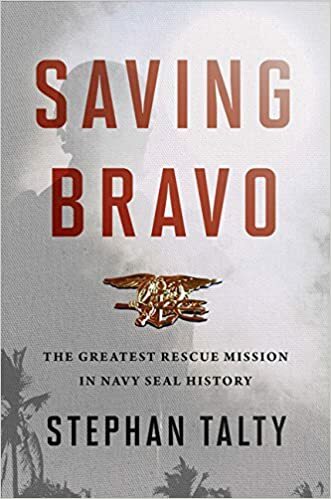 In Saving Bravo: The Greatest Rescue Mission in Navy SEAL History (Houghton Mifflin, 320 pp, $28, hardcover; $14.99, Kindle), Talty has interviewed fliers, survivors, families, friends, and reviewed previously unpublished documents, as well as published secondary sources. And he’s pulled together a thrill ride. Hambleton is sitting behind and just to the right of the pilot of an EB-66 electronic countermeasures aircraft on what’s expected to be a fairly routine mission. His flight suddenly finds itself under a staggering artillery and missile attack. There’s a protocol for evading SAMs, risky but useful. But the missile that takes down Hambleton’s plane is sent up under optical control, without radar guidance until the last moment, so it’s nearly impossible to detect. A huge explosion. Hambleton bails out into a dense, life-saving fog, hides in the underbrush and then is stunned by the rumble of mechanized vehicles, infantry, and the clash of mortars. The only survivor, he has landed in the midst of an enormous ground invasion force. The NVA called it “red fiery summer,” but it soon would earn another name, the 1972 Easter Offensive, an invasion of South Vietnam. Hundreds of Soviet tanks, 30,000 NVA troops, artillery, and missile batteries. To Hambleton, it looks like Stalingrad. One of the first rescue aircraft on the scene, a Cobra, immediately encounters a thundering barrage, thousands of tracers stretching upward. In seconds, the chopper pitches nose-up and plummets to the ground. Hambleton calls in airstrikes on the invasion force that surrounds him, believing rescue is no longer an option. The sky above him is a curtain of shrapnel. It will be eleven days before he escapes. During that time, in a single day, the NVA will launch 83 missiles at American pilots. Ultimately, five branches of the service will be involved in the rescue effort. Hundreds of officers and airmen—and millions of dollars. All for one guy. Hambleton thinks they don’t have a chance. Talty does a masterful job of building tension throughout this suspenseful tale. Yet he takes time to paint subtle images. And Talty offers savvy acknowledgement of the conflicting emotions of Americans who weren’t sure what they were fighting for, whether they had support back home, which way their leaders were leaning, or whether they were even talking to each other. To protect Hambleton, a huge swath of the invasion area was marked off-limits for U.S. counterattacks. As the NVA assault pushed on, there was ignorance–and denial–that resources that might have been used in battle were committed to the desperate rescue of one man. For some troops, it seemed their leaders had gone completely crazy. Eleven men and five aircraft would die trying to reach the navigator. After days of failure, the Air Force finally realized an air rescue was out of the question. At this point, no one south of the DMZ knew that two downed fliers also had been taken prisoner. Enter the guys who slip behind the lines to bring someone back. Navy Lt. Tommy Norris, a SEAL who looks “like a mongoose that had just spotted a brown water snake,” volunteers. The NVA may not know precisely where Hambleton is hiding, but they are listening to his radio communications. To connect him with his rescuers, the Division team develops an incredible code that must be read to be believed. Norris, along with a Vietnamese commando, will make a daring trip into the bush, repeatedly evading enemy patrols, to bring out another flier. Remarkably, they will go back once again, to bring out Hambleton, sick and delirious after his ordeal. Hambleton will win a bucket of medals and live until 85. Norris will be awarded the Medal of Honor. Talty has put together a great read on a remarkable moment in history. Michael Ludden is the author of the detective novels, Tate Drawdy and Alfredo’s Luck, and a newly released collection of newspaper remembrances, Tales From The Morgue.